Ernest Hemingway’s 1952 novella about the epic battle between a poor Cuban fisherman and a giant marlin resulted in a Pulitzer Prize for fiction and revived its author’s career. When The Old Man and the Sea (1958) came to movie screens under the direction of John Sturges, it starred Spencer Tracy as Santiago, its central character: ‘I have never seen or heard of such a fish … but I must kill him’. Sturges had replaced Fred Zinnemann, who felt the story was pointless, ‘with a robot pretending to be a fish in a studio tank pretending to be the Gulf Stream with an actor pretending to be a fisherman’. Nonetheless, over the years, audience appreciation has grown for Tracy’s compelling portrayal of the old man’s grace in coping with adversity. Bosley Crowther of the New York Times wrote, ‘Credit Dimitri Tiomkin for providing a musical score that virtually puts Mr Tracy in the position of a soloist with a symphony’. 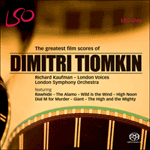 Tiomkin was honoured with his fourth and final Academy Award for the original score.